This is quite a calm spring in the HYIP industry. I must admit that I was expecting more activity in terms of new programs. However, two new programs joined our monitor recently. So, today let’s take a closer look at our latest rivals. The first HYIP I am going to review is a program called CryptoLux. This program was rated positively by the readers immediately after added to the monitor. CryptoLux has been online for 12 days in total, and it joined Golden Stage Listing on Davidnews.com on March 30, 2018. I have reinvested $400 in the program and will keep you updated about the payments status on DavidNews.com monitor. CryptoLux is offering us to get involved in crypto-trading by investing a capital in their trading system. Keep reading to find out more about the program and its features. CryptoLux offers 1.16% up to 1.49% interest rate daily until reaching overall total ROI of 150%. Initial deposit is included in the payments, which means that overall net earning potential for the deposit is 50%. Admins have ranked the % daily returns the following way: Bronze 1.16%, Silver 1.25%, Gold 1.31%, Platinum 1.35%, Sapphire 1.39%, Emerald 1.42%, Ruby 1.42%, Diamond 1.49%. The minimum investment in the program is $10, but the maximum - $500. Withdrawal requests at CryptoLux are processed manually. The minimum amount for withdrawal is $10, but the maximum amount of withdrawal is not set. The program accepts Bitcoin, Litecoin, Ethereum and Bitcoin Cash, Dash, Ripple (XRP), Tether (USDT), Monero (XMR), Lisk Coin (LSK). 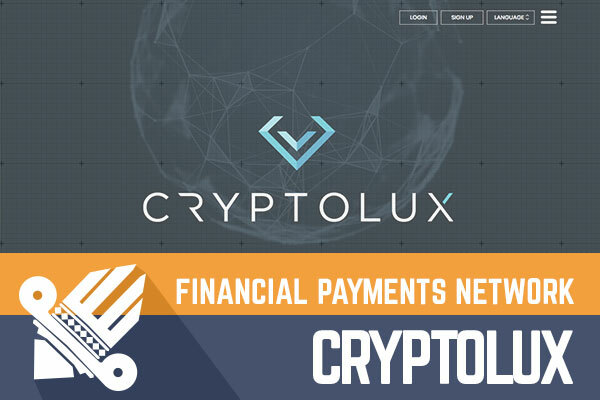 CryptoLux is another HYIP which is built upon the cryptocurrency trend. In short, CryptoLux is a decentralized blockchain based financial payments network created for users who seek independence from the third-party intermediaries like banks and governments. This program offers everyone to participate in crypto-trading by investing in their blockchain based financial payments network. 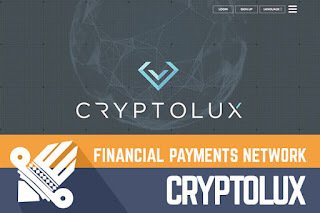 CryptoLux trading system, as the admin claims, is a solution to the industries problems like a slow adaptation of latest technologies in financial industry and payments, lack of stability in the price of the digital currencies etc., providing fast payment transactions as well as opportunities for passive income. Keep in mind that I am quoting here the biography description from the website and it’s totally up to you believe it or not. If you want to learn more about the program in detail - take a look at the Whitepaper, which is available on the website and provides detailed information about investment plans and their legend. Regarding the website, CryptoLux has a website with a professional look and pretty much standard functions for a HYIP website - simple yet modern, the design suits the overall marketing communication approach of cryptocurrency inspired HYIP. However, this is a website where you cannot find everything you need within a few clicks – investment plans, calculator etc. In case you can’t find what, you were looking for, look at the Whitepaper. Moreover, at the bottom of the home page, there is a simple contact form and you can find an online chat on the website for a quick answer. If the lack of information on the website doesn’t surprise me (lately, such web pages have become more common), then the fact that the website content is available on 14 different languages did surprise me a bit. If you are a native speaker in one the 14 languages, then let us know about the quality of translation in the chat box below! I do always search for some extra information about programs across the internet. People on forums just share their investment and withdrawal info and that’s it for now. I think that the exchange of views is still ahead in case the program will last another while. Now there is nothing extraordinary about Cryptolux, which would put this program into a list of bad or good HYIP’s. According to Alexa rank, the main CryptoLux audience comes from Spain, Russia, Iran, Brazil, and India. Of course, Alexa rank must be perceived only as a hint. Admins of this program have chosen to use social media in their overall marketing approach. CryptoLux Facebook account has 5284 followers and 1232 Twitter followers. In March during the launch of the program both profiles were very active. However, since the last post on March 30, the Facebook profile is silent, and the Twitter account has only one post. So, the most important part for me and many of our readers – the investment opportunities. Unfortunately, an investment calculator is not available on the website, however, you can see the calculation of an investment on the dashboard. Just to make it easier to understand what’s what here a quick calculation is. For example, an investment of $200 in CryptoLux would generate a daily return of $2.32 (Rank Bronze). With 1.16% interest rate it takes 87 days to reach the break-even point and 129 days to reach the end of it when $200 investment would have made a net profit of $100. The downside is that the minimum withdrawal is $10, therefore you can withdrawal your profit once in 4,5 days. Today we are looking at a comparably new program with mid-term plans. I wouldn’t say they are the most beneficial. However, they seem to be realistic in terms of running a program for some while due to fact that deposit is included in the payments and lower interest rates, which are more common among mid-term and long-term investment plan programs. The program website looks professional. Let’s see if it goes viral and admin manages to run it at least to allow finishing the first investment cycle for early-bird investors. As usual, if you ever decide to make any investments, don’t invest more than you can afford to lose! Have you already made an investment in CryptoLux and have any useful information to share with us? Please drop a message in the chat box to share your experience! Investment plans: 1.16% up to 1.49% daily until 150%. Initial deposit included in the payments. Invest in Ethereum on eToro the World's Top Social Trading Network!